A young Grace Lee Boggs. Grace Lee Boggs and husband Jimmy Boggs. Grace and Principal Julia Putnam at the James and Grace Lee Boggs School. “Today we need to combine learning with work, political struggle, community service and even play.” Boggs mural, by Katie Yamasaki. But Rich Feldman, who worked with Boggs for over 40 years, thinks that’s missing the point. “It’s so much not about the labels. It’s about how do we look at reality and reflect upon reality and not get locked into the ideas that we may have been molded with at another time in our own lives,” Feldman said. In the documentary film, "American Revolutionary, The Evolution of Grace Lee Boggs," Boggs reflected on her long life in activism. "And as I've grown older, I've understood I should change. And changing was more honorable than not changing..."
“I can remember swearing when I was young that I would not change, because if I changed I would betray the revolution. And as I’ve grown older, I’ve understood I should change. And changing was more honorable than not changing," Boggs said in an interview from the film. At her core, Boggs was a philosopher – someone who believed in the power of ideas, and how those ideas could be shaped into reality. Take the word "revolution." As a young activist, Boggs understood revolution as oppressed people seizing state power. But as she got older, she began to think of revolution in terms of evolution. “Revolution, as Grace often said and wrote about, is for the sole purpose of the evolution of humankind. It’s not to resolve basic grievances. It’s a much more profound transformation of humanity at a particular moment in history,” Feldman said. It’s about reimagining ourselves, she would often say. But some people didn’t buy that. But Grace Boggs loved to argue. She loved to debate. She was fed by it. Journalist Jack Lessenberry said that’s what made her so singular. "Grace Boggs had more mental agility than your average 20-year-old. She was always growing, always expanding..."
“The interesting thing about Grace Boggs is that, as many of us get older, we get sort of stuck, sort of set in our ways. We figure out what we think what the universe is and are reluctant to change. Grace Boggs had more mental agility than your average 20-year-old. She was always growing, always expanding,” Lessenberry said. Grace Lee Boggs was born in Rhode Island in 1915. Her Chinese immigrant parents moved the family to New York City in the 1920s. Her dad ran a Chinese restaurant there. When she was 16 years old, she went to Barnard College, and then on to graduate school at Bryn Mawr for a Ph.D. in philosophy. 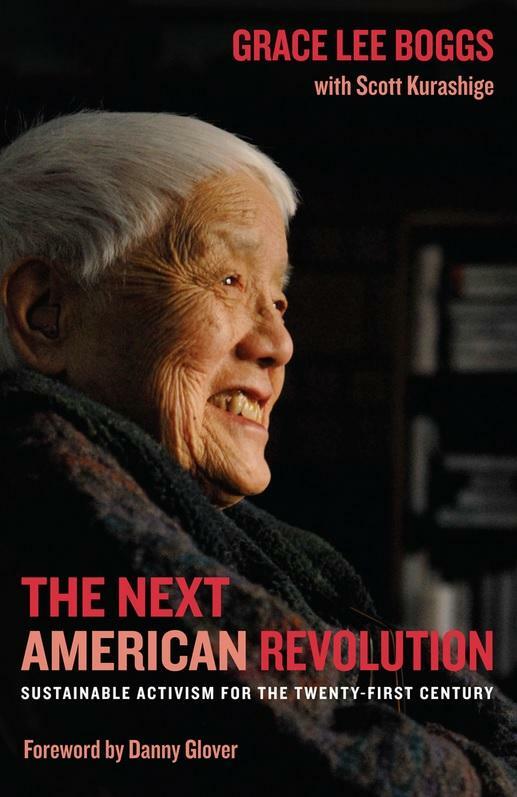 Grace Lee Boggs' book, "The Next American Revolution: Sustainable Activism for the Twenty First Century"
After earning her doctorage in 1940, Boggs discovered that as a Chinese-American woman, she couldn’t even get a job at a department store. So Boggs hopped on a train and headed to Chicago. She got a low-paying job at a library and ended up living in a rat-infested apartment. “One day I came across a meeting of people protesting rat-infested housing. That brought me in contact with the black community for the first time. I was aware that people were suffering, but it was more a statistical thing. And in Chicago, I was coming into contact with it as a human thing," Boggs said in "American Revolutionary." Boggs worked on the paper with an African-American activist, writer, and auto worker named Jimmy Boggs. He and Grace decided to get married after just one date.The two would spend the next 40 years together, organizing and writing and talking. In the 1950s, Jimmy Boggs was working in a Chrysler plant with around 17,000 people. But over the years, as automation set in, most of those jobs would become obsolete, which prompted the Boggs to think deeply about the function of labor and post-industrialization. “What would human beings do when they were not needed for work and for labor to produce? I mean that’s a hell of a question,” Boggs said. In the late 1980s, Detroit Mayor Coleman Young proposed casinos as a way to revive the city’s fading economy. Grace and Jimmy Boggs protested the plan. When Young asked them their solution, they were stuck. Grace Boggs saw this as as a pivotal moment when she began to question the usefulness of protests. "Just being angry, just being resentful, just being outraged, does not constitute revolution," said Boggs. “Just being angry, just being resentful, just being outraged, does not constitute revolution," said Boggs. A year before Jimmy Boggs died in 1993, he and Grace co-founded Detroit Summer. There might not be many jobs anymore, they said. But there's lots to work to get done. Houses to restore, gardens to plant, murals to be painted. Julia Putnam was the first teenager to sign up for Detroit Summer. “The first conversation I remember having with Grace was when I was sitting with a group of my friends and we were talking about something frivolous – I don’t remember. She sat down and said, 'so how are we going to solve the problem of vacant homes in Detroit?' Something really profound and difficult and complex. And it was very clear to me that she really thought we had something to say about it and she really wanted to hear it,” Putnam recalled. School should be a place where students contribute to the well-being of their communities. Boggs liked to call the students at the school "solutionaries." Putnam was so influenced by the Boggs that she opened a school last year just a few miles from their home. She named it the James and Grace Lee Boggs School. It’s built around the couple’s idea that school should be a place where students contribute to the well-being of their communities. Boggs liked to call the students at the school "solutionaries." Grace Lee Boggs wasn’t sick. She was 100, and surrounded by friends, including Barbara Stachowski. “She really helped me cut through a lot of bulls---. And cut through, don’t spend your time being angry about this. What can you do? You’re mad about this, but don’t protest it, what’s your solution,” said Stachowski. Grace Lee Boggs is survived by her friends and comrades at the James and Grace Lee Boggs Center, by her neighbors, and by anyone struggling with her favorite question: "What time is it on the clock of the world?" Click below to watch a video about Julia Putnam and her mentor, Grace Lee Boggs, by andrea claire maio on Vimeo. Chris and Ariel from andrea claire maio on Vimeo. Grace Lee Boggs celebrates her 99th birthday this week. The Detroit woman is an icon of the Black Power, civil rights and labor movements. She was born to Chinese immigrant parents in 1915. Eventually, she became one of the only non-black and female leaders in the Black Power Movement. A new film about Grace Lee Boggs, "American Revolutionary: The Evolution of Grace Lee Boggs," will debut on the PBS series "POV" on June 30. Filmmaker Grace Lee joined Stateside today. Grace Lee is not related to Grace Lee Boggs but said their names brought them together when Lee created a film called "The Grace Lee Project," which explored the many facets of Asian American women and the common name of Grace Lee. “I knew that when I met Grace Lee Boggs that I would have to make a longer film about her someday,” Lee said. And that’s what she did. Lee said what really drew her in was the idea that evolution is part of revolution, a comment made in a lot of Grace Lee Boggs' writing. “I think the ability to really reflect on what a certain movement has given us and where there might be contradictions and where you can sort of move forward from that has really been helpful for me in my own life,” Lee said. Lee said that what she hopes viewers take away from the film is that the story is not just an evolution of Boggs, but of the story of Detroit and the United States. “I think it is really important for us to know these stories that may not necessarily be so familiar, but they are just sort of under the surface,” Lee said. You can read more about the film on PBS website here.